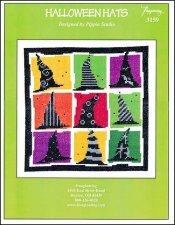 Halloween Hats [H1960] - $6.00 : Yarn Tree, Your wholesale source for cross stitch supplies. Cross stitch chart from Imaginating. Designed by Pippin Studio. The witch will be our guide on this ride & has decided to bring us some hats to try. A black hat with swirls, dots or lines...we can't begin to decide. Stitch count is 110v x 110h. Stitched on #2936 Zweigart Aida 14ct White 59" wide or #8221 Zweigart Aida 14ct White 43" wide.